How to get rid of menstrual myths? The first step in getting rid of menstrual myths is to talk about them. It is a good idea to ask if there is any scientific basis to what you're told about your periods. Once you are aware and capable of separating a myth from scientific fact, you can also help others by giving them right information. MYTH: A menstruating woman is impure, dirty, sick or even cursed. Where did menstrual myths originate from and how do they spread? 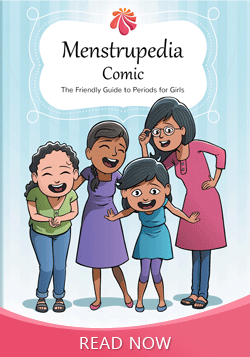 What are menstrual myths and how do they affect a girl or a woman? DISCLAIMER: The information provided on this site is for educational purposes only and is not to be considered a substitute for professional medical consultation. Our passionate community members share ideas and their personal stories on how they are breaking the taboo around Menstruation. Receive their thought provoking ideas and tips via email once a month.